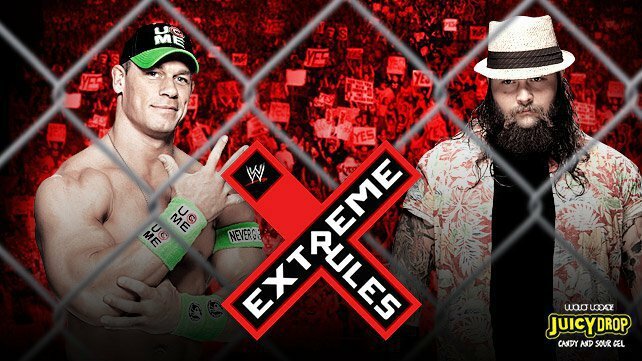 It’s time for WWE Extreme Rules on Sunday night from the IZOD Center in East Rutherford, New Jersey. 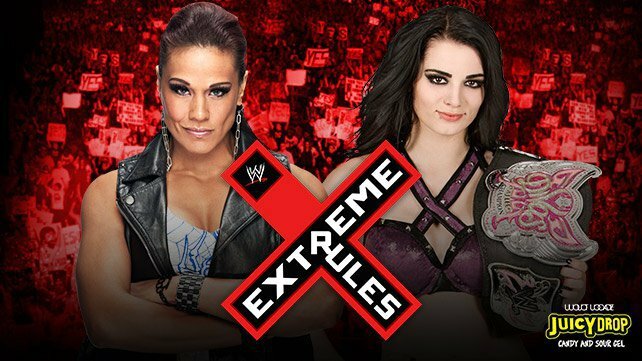 The first PPV (or Special Event) following WrestleMania is usually pretty good because stories from WrestleMania often lead to matches at Extreme Rules and that’s the case this year too. The top three matches got a lot of television time in the last month, so they have been built up really well. That’s something WWE usually does very well. Before we get to the preview, why don’t we all watch that fantastic choir from Monday’s Raw one more time? Those kids did an amazing job. That song is catchy too. Admit it. Here’s a look at everything on the card with predictions of every match. Note: All graphics are from WWE.com. The banner is courtesy of my friend Steve Melo. I actually don’t hate this match as much as most people because I think Torito is awesome. Hornswoggle is much better as a 3MB member then he was as the original Hornswoggle character too. What bothers me is that they’re putting this on a PPV. I understand that the kids might like it, but there are so many other talented wrestlers that will be watching this show that could have been in a match like this. I’ll take Hornswoggle just because he’s a crafty heel now. That tournament to determine the top contender for the IC Title was a great idea in theory, but they did a poor job of having a final match that was memorable. It was as if Barrett’s match with RVD didn’t even matter compared to the storyline that RVD was thrust into. Barrett did have an impressive win in the tournament over Sheamus and it’s nice to see him with momentum. His character reboot has been really interesting to see. It seems as if Big E is a forgotten man because he’s barely been visible on television for months now and when he is, all we ever see him doing is watching others have matches. He’s still somebody in his late 20s with a really bright future, so I think he has a lot of value long term. Does a win for Barrett really elevate him? Not sure. He’s been IC Champ three times before. 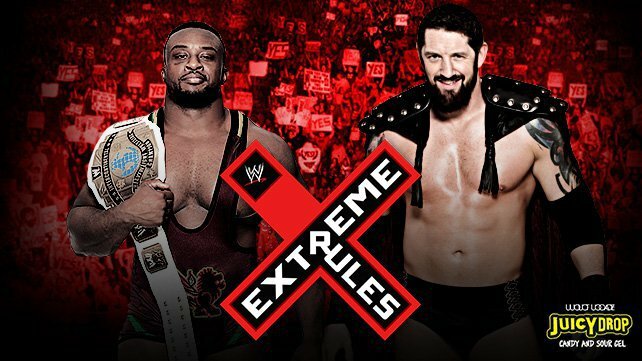 I feel like what they should do is have Big E retain in this match and then either keep the feud going or have Barrett target a bigger fish so to speak so then he can be seen as a bigger star. Winning or losing the IC Title doesn’t really help him that much. Just because Barrett has been featured on TV more does not mean he’s going to win. It’s just a way to build him up as a credible challenger. I think Big E finds a way to retain, but don’t be surprised if the feud continues for another month. There’s no reason for Paige to lose this match. She’s been the Divas Champion for about a month now and has been impressive in doing so. Her offense looks credible. She’s won over the fans already. All she needs now are some credible wins. Tamina’s been booked strongly as a heel although one thing I don’t like about her is that she uses the Superfly Splash. Just because her dad did it doesn’t mean she should. She’s a power wrestler that should be doing only power moves. Her dad was a high flyer. She is not. It doesn’t look good. Anyway, this should be a win for Paige in a competitive 7 minute match where she could be booked as the underdog due to Tamina being the bigger of the two women. It’s the easiest match to predict. Obviously Rusev gets the win over two guys that are barely on TV at this point. My favorite part of the match will be all the times Lana is on screen. It should be a dominant win by Rusev in under five minutes. Maybe even three minutes. This was mentioned as an elimination match, which is cool with me. They don’t do elimination three ways enough. It’s more enjoyable to watch. It’s weird that Swagger is even in the match since Cesaro beat him clean a couple of times. Nobody is going to think Swagger has a chance here, nor should they. They did the Cesaro/RVD story because Cesaro lost to RVD in the IC Title tourney and then Cesaro cost RVD in the finals. It’s so weird to see Cesaro still in a heel role considering how much the fans want to cheer him. They will turn him face down the road, but having Heyman with him is a good way to keep him heel. 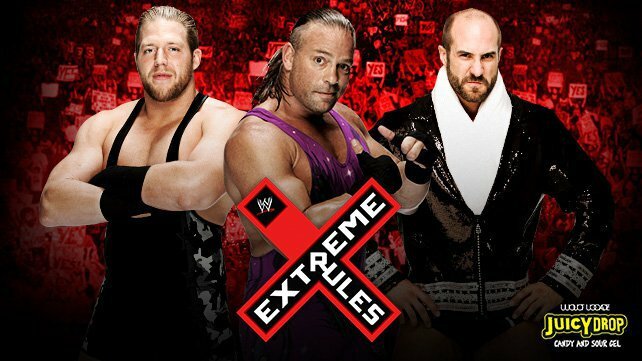 As for RVD, he’s a guy in his early 40s that has some credibility left. That’s why they’ll have Cesaro get a win over him. On a side note, can somebody tell Michael Cole that RVD’s offense isn’t “innovative” if he’s been doing the same moves for about 15 years now? Maybe it was in 1999. Not now. Thank you. Expect a clean win for Cesaro since he’s clearly a star on the rise. When they had their match at WrestleMania it was the toughest match to predict on that card. It was also one where I wrote that no matter who won, they would likely have a rematch that the WrestleMania loser would win. Here we are at Extreme Rules coming off the heels of Cena’s WrestleMania win and I’m thinking they have to book Wyatt to win here. If they don’t it would hurt any momentum he’s built up since they put him over Daniel Bryan clean at the Royal Rumble. You want Wyatt to be a top guy? Give him the win here. Cena doesn’t need wins. He can lose 20 matches in a row and people would absolutely believe it if he won the WWE Title the next night. However, he’s not at a point in his career where WWE is going to turn him into the older babyface wrestler that loses all the time. Cena’s 37, but that’s not that old. He’s got plenty of years left as a top guy. It’s great that he’s feuding with a guy ten years younger than him like Wyatt is. That’s an encouraging sign. The steel cage setting is interesting because Cena said he wanted it as a way to keep Erick Rowan and Luke Harper from interfering. Cena beat Wyatt clean at WrestleMania without those two doing anything. This one feels like a match that will still have interference because I think it’s unlikely that Cena is going to lose clean to Wyatt even in a cage match. Maybe a fourth Wyatt Family member debuts. Something special has to happen for Cena to lose this match. The booking of this one is very intriguing to me. I’m looking forward to it. If Kane won the WWE Title here that would really piss off fans, right? It would piss me off too. I really doubt that it will happen, though. Bryan is being booked like the underdog even though he’s the WWE Champion. That’s because they have really pushed Kane’s “new” character direction hard. By bringing back the masked version of Kane, it makes fans forget about the fact that he lost a lot of matches as Corporate Kane, including several to Bryan. Kane is the oldest wrestler on the active roster, so he brings a lot of credibility to the table even though some fans may not consider him a big name anymore since he’s been repackaged so many times the last few years. 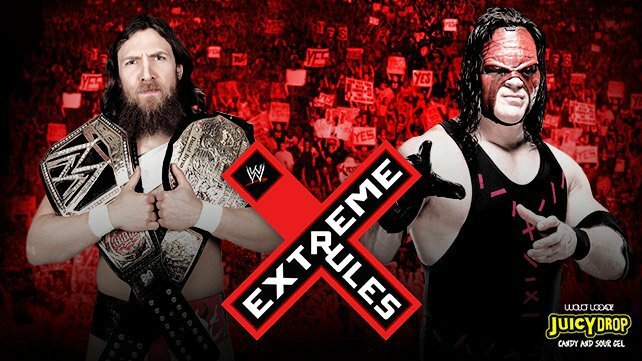 The Extreme Rules stipulation means that Bryan’s win will likely be clean or at least decisive in some way. Don’t be surprised if he incorporates a weapon into the finish. Perhaps the use of a steel chair or a kendo stick with the Yes Lock like he’s done against Randy Orton in the past. 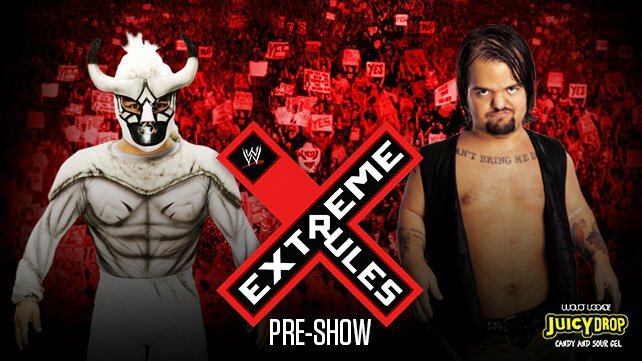 Even though a Bryan is very likely, there’s a chance the feud continues past Extreme Rules too. Maybe Kane will attack him after the match or on Monday’s Raw. It’s hard to know who Bryan’s next challenger will be, but I see him retaining his championship here. As an aside, can they just ditch the World Title? Keep the WWE Title because it has the company logo on it and it’s only been around for a year. It’s ridiculous to have a guy still carrying around two titles at a time. This feels like the main event to me. Whether it goes on last or not, we have no idea at this point. Maybe some people would be upset because Daniel Bryan wouldn’t be in the main event, but I think it’s fine if this match goes on last because it’s a match that is elevating The Shield just because of who they are in the ring with. Earlier this week I wrote about how Evolution was WWE’s best stable ever and it’s because they were booked in a way that elevated everybody in the group. You don’t always get that. The Shield is on that same path, which is why this match is something to get excited about. Something that I’ve written about many times in the last month is that I feel like The Shield is going to break up soon. That’s not a bold prediction, I know. They turned face so that Ambrose & Rollins can turn on Reigns with the goal of making Reigns a bigger babyface star. The thing about that is they have a lot of time to do it because the big babyface push of Reigns will likely happen early next year around the time of the Royal Rumble. If his buddies turn on him perhaps in the Money in the Bank match then that would set up some big matches in the summer. The point is there’s no need to do it now. The reunion of Evolution has been fun to watch just because they did a great job of staying apart for most of the past ten years. They’ve all feuded with one another many times, but they were not a heel group again. That’s a big reason why they’re fresh right now. When Batista said they have won 31 combined World Titles that speaks volumes of their credibility. Seeing The Wyatt Family against The Shield was a lot of fun, but Evolution is on a whole other level. My feeling is that The Shield will win a classic battle after 20 minutes of action with Reigns getting the win for his team. They haven’t teased a split of any kind. If they lost the match then maybe that could lead to some kind of issue with them, but my feeling is they can still do that down the road. There’s plenty of time for The Shield to do the split. Not yet. This win will be the biggest of their careers. It will be a happy ending at Extreme Rules. It’s a show that will depend on the quality of the top three matches. If they all get 20 minutes and they all tell the right kind of story then it’s going to be an above average show. I think the booking of the Cena/Wyatt and Evolution/Shield matches are both very interesting. Those are the matches people will be talking about the most come Monday morning. The midcard could be better, but it’s not that bad. 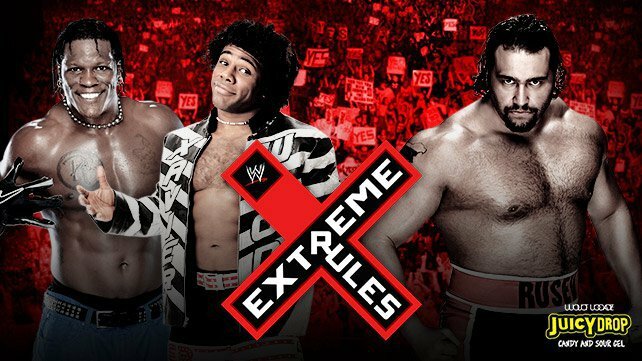 I am cautiously optimistic about Extreme Rules. Since my Toronto Raptors game 7 will be played on Sunday at 1pmET, my evening is free and that means I’ll be able to write about Extreme Rules live at 8pmET on TJRWrestling.com. There will be a full recap of everything that happened with the results and analysis of everything on the show. I’ll post it at other sites on Monday.